Martha Berry apologizes for missing Mr. Harris and his wife when they visited the Foundation School. She explains that she needs someone to run a boarding house for boarders doing construction work on buildings at the schools. She asks Mr. Harris if he and his wife would be interested in running the boarding house. 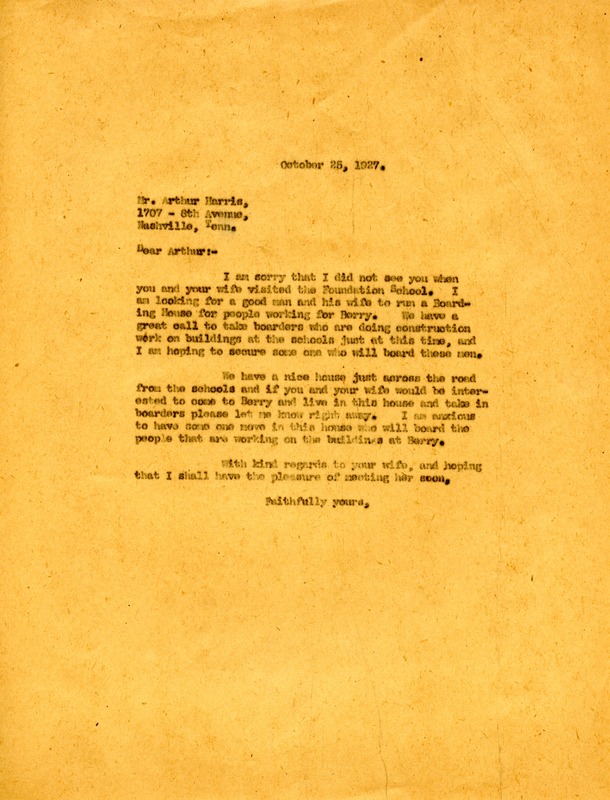 Martha Berry, “Letter to Arthur Harris from Martha Berry.” Martha Berry Digital Archive. Eds. Schlitz, Stephanie A., Chelsea Risley, et al. Mount Berry: Berry College, 2012. accessed April 22, 2019, https://mbda.berry.edu/items/show/4518.